I love London, the theatre, the streets, museums and castles and tea. Tea always tastes better in London and on day, my husband and I discovered Twining’s. H.R. Twining & Co., Ltd, London, a trailblazer in specialty teas for almost three centuries began with the purchase of Tom’s Coffee House by Thomas Twining in 1706. Located in the rear of its present site at 216 Strand, it attracted gentlemen who engaged in serious discussions and scalawags who frittered away time in frivolous chatter while indulging in brandy, rum and arrack (an alcoholic drink distilled from rice or molasses) and drinking water from Bath and Bristol. Thomas soon offered a new drink that had begun to gain favor with the public – tea. Of course, a woman of social standing never placed her dainty foot inside a coffee house; a lady would wait in her carriage while a manservant fetched the refreshment. Eleven years later, Thomas opened The Golden Lyon. Despite high taxes and dire warnings issued by the medical profession and the church against the brew, tea became fashionable and members of Court Circles and the Royal Household patronized the establishment. In 1797, Tom’s grandson, Richard Twining, built a doorway on the Strand opposite the Royal Courts of Justice. Above the shop’s Royal Crest, centered between two colorful Chinese figures, he incorporated the symbol of the Golden Lyon, attracting the eye of the beholder to The House of Twining. Today, the fragrance of choice teas and coffees still wafts past the entrance offering an irresistible invitation to the passer-by. Teas range from Prince of Wales, Orange Pekoe, Earl Grey, Darjeeling, China Black or Lady Grey to the finest Assam plus a selection of over 13 different types of coffee. Accompanying the teas are an assortment of fine crackers and jams, neckties, aprons, tea towels, mirrors, bone china mugs, cups and saucers, coffee makers, limited edition teapots and teapots shaped like bears, vegetables and birdhouses. A portrait of the founder, attributed to William Hogarth, welcomes memorabilia addicts to the Museum at the rear of the shop. Displayed are a copy of the Royal Warrant issued to Richard Twining II by Queen Victoria in 1837, a Buddha, carved from the roots of a tea bush, invoices dating back to 1715 and pictures of Thomas and his son Daniel on a 1737 tea wrapper. Maps and advertisements for tea, coffee, chocolate, sage and snuff adorn the walls along with prints of tea trading. One that appeared in the London Chronicle, in 1770, states business would continue as usual despite a warehouse fire. The back room is also home to Victorian tea tins, the first Twining illustrated advertisement for packet tea (introduced during the 19th century,) and 19th century tea scales. Models and photos of delivery vans (with and without horses,) and an Edwardian double teapot are exhibited along with a T.I.P. – To Insure Promptness – box. The box was nailed to the wall in coffee houses and parched patrons who desired good service would place money in the box. Damaged during the Second World War, 216 Strand was rebuilt in 1952 ensuring its reputation as the oldest company (Teamen to connoisseurs, by appointment to Her Majesty Queen Elizabeth II) to have traded continuously on the same site. 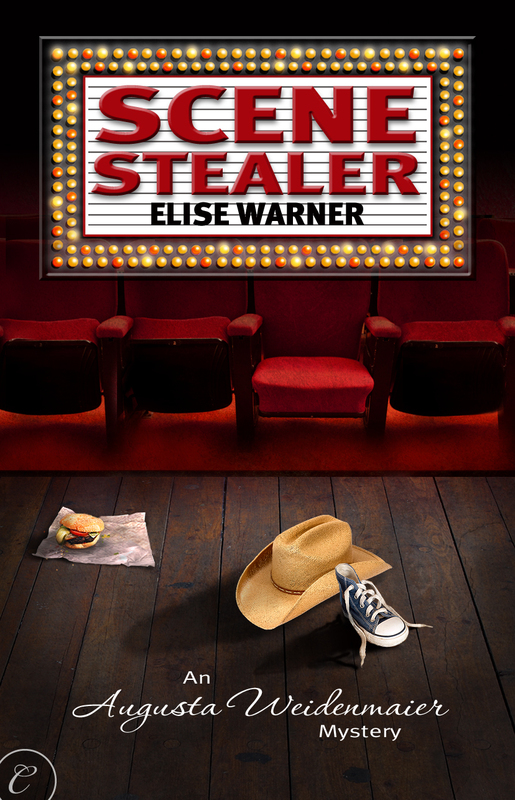 For more information about me, please visit my website http://www.elisewarner.com To purchase my mystery Scene Stealer please visit http://www.barnesandnoble.com, amazon.com, carinapress.com and any site that sells eBooks. This entry was posted on August 30, 2010 at 2:38 pm and is filed under authors, New Yorkers, tea and coffee lovers, Uncategorized, writers. You can follow any responses to this entry through the RSS 2.0 feed. You can leave a response, or trackback from your own site. I found you via the Meet an Author Monday blog hop and I’m so glad I did. I’m planning a trip to London this coming winter to visit my sister, and I think we must make a visit to The House of Twining! Thanks so much for the tip. It’s great fun. The last time we were there, Lord Twining just happened to pop in. Loved the story. I’m a Twinings drinker, but didn’t know the background. Nicki — *envy* London is one of the top places on my list of “one day”.